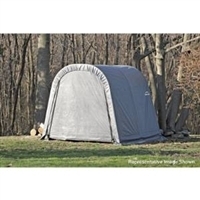 Get more headroom space with the affordable, portable ShelterLogic Round Style Shed/Storage Shelter. It is the perfect storage solution for ATVs, motorcycles, lawn and garden equipment, small tractors, deck and patio furniture, pool supplies, tools and equipment, wood seasoning, bulk storage and more. 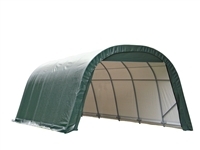 Easy to install and constructed with quality frame and fabric components, all designed to stand up to the elements. Great For: Trucks, cars, SUV's, smaller recreational vehicles, trailers, lawn and garden tractors, bulk storage. Rugged Ratchet Tite tensioning for quick and easy cover installation.
. Easy to install and constructed with quality frame and fabric components, all designed to stand up to the elements.